I’d ask where books like My Own Worst Frenemy were when I was a young reader, but I already know the answer – they didn’t exist. It’s why I started writing YA, in the first place. Reviewing books like Reid’s first in the Langdon Prep series is bittersweet for me. On one hand I feel like doing a friggin’ back flip to celebrate their arrival. On the other, I’m so annoyed that it’s seriously taken publishing this long to acknowledge that readers (of color or not) would enjoy a book like this. That said, My Own Worst Frenemy is quite a gem. Readers looking to infuse a little mystery in their lives will love it. Chanti Evans (confession: every time I saw the MC’s name I wanted to call her Chianti – just how my brain works) is from a working-class hood in Denver. Her mom’s an undercover cop who wants Chanti’s academic career to have a fighting chance, so she sends her to Langdon Prep a snooty private school where all schools are in books – across town. 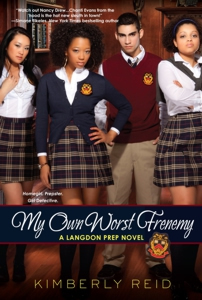 My Own Worst Frenemy is a good first in a series book. We meet Chanti, Bethanie (a sure-fire frenemy in the making), Marco (the future BF) and of course there’s a female and male meanie, Lissa and her twin Justin. Getting to know them all is most of the fun, but this is a mystery after all – so there’s some intrigue and sleuthing involved. Chanti and Marco are full-bodied characters. They feel real and readers will care about them. But note to authors: stop making main characters so insecure. We all know they’re going to end up with dude in the end. Enough with them putting themselves down just to build up the tension revolved around the growing love interest! Chanti is African-American and Marco is Mexican. I’m fairly certain the other characters are of color too, but the book doesn’t dwell on that. Which is a plus. The reader can assume everyone is brown or not – it’s up to them really. The chapters revolve between the present and flashbacks of how Chanti ended up in trouble and thus at Langdon. The flashbacks were distracting and sometimes slowed down the action. It was obvious Chanti had gotten caught up in something, but since she’s not in juvie or jail, it couldn’t have been that serious. So, really, it almost didn’t matter to me how she ended up there. For the sake of the series, I hope the flashbacks end at book one. Like most mysteries that involve teen sleuthing, the reader will have to suspend a little belief about just how much knowledge and moxie Chanti has. But that’s the fun of reading mysteries, right? We all want the MC to be a bit more courageous and smarter than we would be in the situation. Chanti’s righteously nosy and observant which makes her a great investigator and ripe to be a new millennium girl-detective idol. Have to think about this one. Only available in paperback, which lasts so poorly in my library. Sigh. I know my students would love the book. I love this book it’s a good book to read. I also love the charcter Chanti as well.